Since the start of the economic recovery in 2009, employment is up and unemployment is down for all groups of workers. But progress overall has been slow, and the growth in jobs has barely kept up with the growth in the working-age population for most groups. As a result, the employment rate—the share of the working-age population with jobs—has not improved by much in the recovery for any group. Declines in unemployment rates have also been modest and driven in part by ongoing withdrawals of people from job-seeking activities. Although employment trends are moving in the same direction for all groups, the speed varies across groups. Hispanics and Asians are gaining jobs at a faster rate than blacks and whites, foreign-born workers are outpacing native-born workers, and men are faring better than women in the recovery. With the exception of trends by gender, the differences in jobs growth reflect differences in population growth—groups whose populations are growing faster than average are experiencing more rapid employment gains. After shedding 7.8 million jobs because of the recession, the U.S. economy added 3.2 million jobs in the first two years of the recovery. The partial recovery in jobs was not nearly enough to boost the share of the working-age population that is employed. The employment rate, after plunging from 63.0% in the fourth quarter of 2007 to 58.5% in the fourth quarter of 2009, stood at 58.7% at the end of 2011. The drop in the unemployment rate—from 9.6% in the fourth quarter of 2009 to 8.3% in the fourth quarter of 2011—has also been small compared with its five percentage point increase in the recession. Hispanics and Asians are the only groups to have experienced employment gains that exceeded the numbers of jobs lost in the recession. 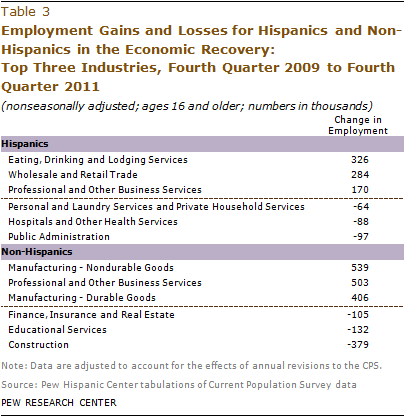 Hispanics lost 473,000 jobs in the recession but gained 1.3 million in the recovery; Asians lost 193,000 jobs in the recession and have gained 455,000 in the recovery. Whites recovered 1 million jobs during the recovery and blacks found 318,000 jobs. For these two groups, however, job losses were higher in the recession—nearly 6 million for whites and 1.1 million for blacks. The differences in employment gains across racial and ethnic groups mirror differences in the additions to their populations. From the fourth quarter to 2009 to the fourth quarter of 2011, the Hispanic working-age population increased 6.0% and employment increased 6.5%. For Asians, the working-age population increased 6.2% and employment rose 6.8%. Employment growth for whites and blacks was much less in the recovery—1.1% and 2.2%, respectively—but so was the growth in their working-age populations—0.5% and 1.7%, respectively. Because jobs growth for each group has virtually marched in tandem with its population growth, the employment rate for each group has edged up only slightly in the recovery. Even though employment rose in large numbers for Hispanics, their employment rate increased only a little, from 59.2% in the fourth quarter of 2009 to 59.5% in the fourth quarter of 2011. Similarly, the employment rate for Asians inched up from 60.0% to 60.4%. Small increases also characterize the recovery in the employment rates for whites and blacks. If the employment rate is used as the criterion, Hispanics and blacks are seen to lag behind others in the recovery from the recession. These two groups experienced steeper drops in their employment rates in the recession, 5.3 percentage points for Hispanics and 5.8 percentage points for blacks from the fourth quarter of 2007 to the fourth quarter of 2009. 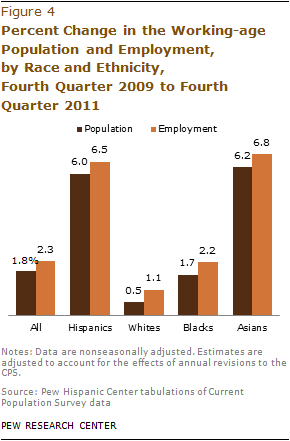 For them, employment rates in the fourth quarter of 2011 were still at least five percentage points less than the rates in the fourth quarter of 2007 compared with a deficit of about four percentage points each for whites and Asians. Unemployment rates have trended down more sharply in the recovery than employment rates have trended up. 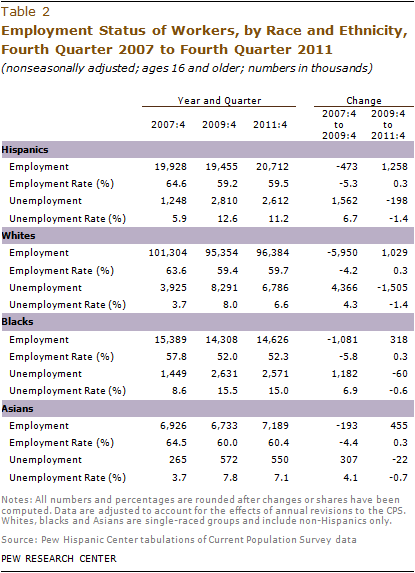 From the fourth quarter of 2009 to the fourth quarter of 2011, the unemployment rate for Hispanics fell from 12.6% to 11.2%; for whites, from 8.0% to 6.6%; for blacks, from 15.5% to 15.0%; and for Asians, from 7.8% to 7.1%. For all groups, however, unemployment rates remain substantially above their levels before the start of the recession in the fourth quarter of 2007. At least part of the drop in unemployment rates is due to ongoing declines in labor market activity by people 16 and older. Factors that may cause people to leave the labor market, temporarily or for good, include being discouraged over job prospects, childbirth, illness or disability, and retirement. People who exit the labor market are not counted among the unemployed and if more people choose that path the unemployment rate can drop even if there has been no growth in employment. Among whites, the labor force participation rate decreased from 64.6% in the fourth quarter of 2009 to 63.9% in the fourth quarter of 2011. In addition to the lingering economic disincentives arising from the recession, the aging of the baby boomers is a significant force reducing the number of whites in the labor force. Labor force participation rates for blacks and Asians fell only slightly in the recovery. Three industries added a sizable number of jobs for both Hispanics and non-Hispanics in the economic recovery. Professional business services, an industry that includes everything from management to landscaping services, added 170,000 jobs for Hispanics and 503,000 jobs for non-Hispanics from the fourth quarter of 2009 to the fourth quarter of 2011. Wholesale and retail provided an additional 284,000 jobs to Hispanics and 314,000 jobs to non-Hispanics. Manufacturing, durable and non-durable, absorbed 112,000 more Hispanics and 945,000 more non-Hispanics. Among these three industries, only employment in professional business services is now higher than its pre-recession level. For Hispanics, the leading source of jobs growth was the eating, drinking and lodging services sector. Their employment in hospitality jobs increased 326,000 from the fourth quarter of 2009 to the fourth quarter of 2011. Notably, Hispanics also gained 101,000 jobs in construction.